Ministry of Health announced to ban the import, exhibition, and usage of a flowering plant called Khat which contains addictive substances Cathinone and Cathine, according to the ministry’s prakas dated on 10 July 2018. 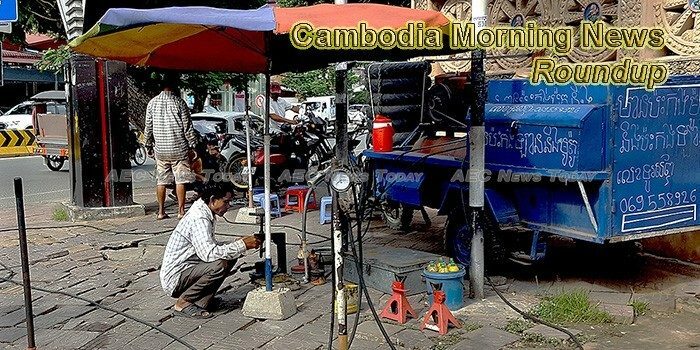 World Bank has provided a loan of $200 million to the Royal Government of Cambodia to upgrade the quality of National Road No.4 and education improvement. Poipet city, Banteay Meanchey province – The sound of vehicles and crowds were deafening across this bustling border town near the Poipet International Border Checkpoint yesterday. Six financial institutions are offering loans specially created to help students finance their education in tourism-related fields, the Ministry of Tourism announced this week. In opening remarks at a recent event, Secretary of State at the Ministry of Foreign Affairs and International Cooperation Luy David said information can be a double-edged sword. The Minister of Agriculture yesterday said the government’s programme to boost agricultural output is well on its way to achieve its goals, but called on farmers and firms to modernise and abide by international standards of agricultural and production practice to ensure the programme’s success. The Interior Ministry’s anti-cyber crime department yesterday warned social network users to be aware of scammers who make false claims about lottery or award wins. The head of the Cambodia Securities Exchange (CSX) on Wednesday urged businesses in the Kingdom to consider utilising private equity funds, saying it would help them grow faster and make it easier for them to list on the exchange in the future. The Ministry of Water Resources yesterday issued a flood alert in some provinces due to heavy rain while it also opened the gates of dams in Kampot and Battambang provinces to release excess water. Ruili Airlines is pleasured to offer a new route “Phnom Penh-Kunming” with prices net start at 20 RMB starting from July 13, 2018 following the recognitions and supports by our regional and international passengers. His Majesty King Norodom Sihamoni expressed his condolences to Japanese Emperor Akihito regarding a massive flooding in southern and western parts of Japan, prompting millions of people to evacuate their homes and have claimed the lives of hundreds of Japanese citizens. The Asean+3 Macroeconomic Research Office (Amro), a Singapore-based independent regional surveillance unit, this week said technological advancements will threaten significant job losses in the Asean region, particularly in least developed economies like Cambodia, and that carefully designed mechanisms need to be put in place in these countries to retrain the workforce. The Kingdom’s first ever real estate awards took place late last week, with sector leaders saying the event would only serve to aid an already growing industry.